In the heart of the magnificent Magaliesberg mountain range lies Mamagalie Mountain Lodge. Head northwest from Johannesburg and after a one and a half hour's journey our warm welcome awaits you. On arrival, relax and unwind with a refreshing drink, then take time to enjoy the majestic views over the Buffelspoort Valley and dam while you cool off in the swimming pool. Spend the evenings in peaceful elegance, cuddled up to a cozy log fire, or sit around the fire pit and after cooking your meal, enjoy the star studded skies and listen to the nocturnal inhabitants commence their vigil. 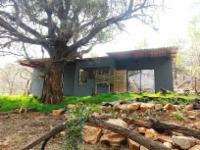 Welcome the new day with a stroll through the secluded kloof, and listen to the exquisite sounds of the wakening bush. We have 1000 acres of private and pristine bush and mountain veld for you to explore at your leisure. An energetic walk to the top of the mountain will give you views you only dream of, and if it is warm enough, take a dip in the pure, sparkling rock pools. The bush is a nature lover's paradise, with numerous species of flora and fauna. Bird lovers are normally assured of sightings of the Black (Vereaux's) Eagle and Cape Vulture, as well as an abundance of the smaller species.You are certain to enjoy absolute privacy as the lodge is only let to one party at a time. Sleeping from two to twelve people in stylish luxury, our accommodation has been described as 'world class'. We allow our guests to take time away from the daily grind, as our friendly staff services the lodge.This self-catering luxury unit has a fully equipped kitchen, furnished to the highest standards with a large stove, fridge/freezer, and convection microwave. The only things you will need during your stay are food and beverage. We believe our four star grading is well deserved, but don't let us try and convince you, come and visit us and find out for yourself. Our newly opened Bush Lodge provides the ultimate in privacy; this 4 star unit has a private plunge pool and braai area and is built over three levels into the tree canopy. Sleeping from 2 to 4 people it has a luxurious bathroom with bath and shower, separate toilet. The kitchen is fully equipped with gas stove and oven and a large fridge/freezer. There is no microwave or T.V. We believe this unit offers the most affordable four star accommodation in the country. Guests are required to pay a R200 CASH deposit on arrival, which will be refunded via EFT after departure if there are no breakages. Where a 2 night booking covers a Friday or Saturday night, the full weekend rate is payable. Balance of payment is due in cash/CC on arrival or EFT prior. We have a minimum night stay of two nights.... Guests are required to pay a R200 CASH deposit on arrival, which will be refunded via EFT after departure if there are no breakages. Where a 2 night booking covers a Friday or Saturday night, the full weekend rate is payable. Balance of payment is due in cash/CC on arrival or EFT prior. We have a minimum night stay of two nights. Checking in after 20h00 in the evening is not possible without prior arrangement. A late check-in fee will apply to any check ins not completed before 20h00. Our standard check-in time is between 15h00 and 20h00; check out before 10h00. Mountain Lodge Sleeps 12 Includes: Self-catering 3 Double bedrooms and open plan bunk room sleeps 2-12. Fully equipped for luxury self catering. Private pool and braai. Forest Lodge Sleeps 4 Includes: Self-catering Extremely private. Double bedroom and double sleeper couch in lounge. Fully equipped for self catering. Braai area. Just the place for getting away from it all. No TV, radio or city noise. We stayed at the Tranquillity Lodge at Mamagalie, and it was awesome! Each lodge is completely out of sight and private from the eachother, which is great for privacy. The farm is extremely quiet and relaxing. Staying in the trees for a few days and only seeing monkeys and hornbills was just what the doctor ordered! Mamagalie Mountain Lodge is 5.1km from the centre of Buffelspoort , the nearest airport 46.8km (Lanseria International Airport).